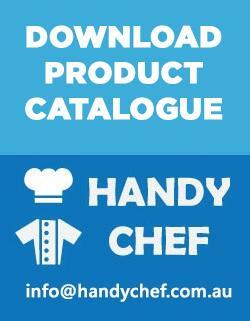 Is handychef.com.au a safe and secure website to enter my personal and credit card details? Yes, your privacy is extremely important to us and we take pride in protecting your information. All credit card transactions go through PayPal which is highly secure. We do not store or keep your credit card details on our systems for our records. When you use PayPal, your financial information is never shared with the merchant. Paypal also offer great Buyer Protection, and it's free to sign up too! Click the product category you wish to view on the left menu for Products, then click a particular item you wish to view and buy by clicking "View Details"
A Pop up window in black overlay background will appear, where you have two choices to make, which is "Continue Shopping" if you want to keep shopping, or "Checkout" if you are finished with shopping. 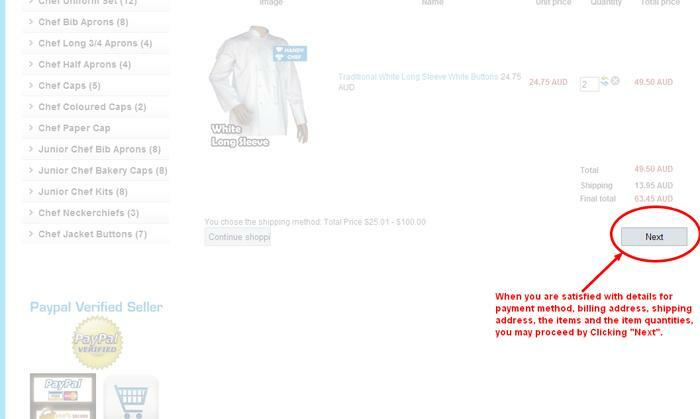 Alternatively when you close the pop up window, you can click "Continue Shopping" or "Checkout" button in the product page. In Checkout Page, fill your information details in the form. Then click "Continue" button to proceed. In the next screen you are shown many options. First is billing addres, where you have option to add new billing address, and in order to do that, click "New" button and follow the instructions by entering the new address into form where it is appropriate. Second, shipping address. Tick the check box/radio box for "Use the same address as for billing" option, if you wish to use the billing address as shipping address. Third, choose payment method you are going to use. It can be either Bank Transfer or PayPal. With PayPal method you can also pay using MasterCard or VISA through PayPal. If you wish to pay using MasterCard or VISA, please choose "PayPal" checkbox. If you do not have PayPal account, click "Checkout" button, you have option to pay by Credit or Debit Card as well as create new PayPal account by filling pre-made form. Now scroll down to find the list of purchased or added products. 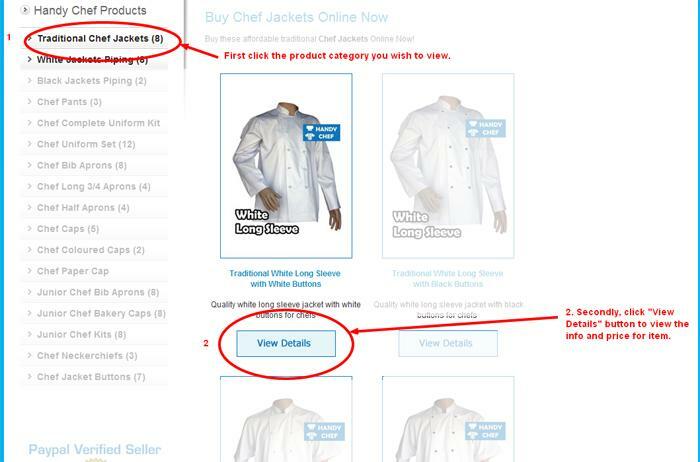 If you wish to change the quantity of items, simply edit and enter the number of items in the white box provided under "Quantity" column. 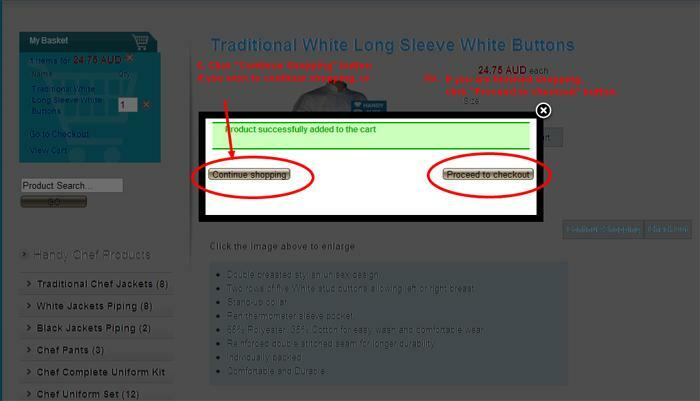 If you wish to delete a particular product that you do not want to add into cart, click "X" icon that is on the right of the quantity box to delete it. 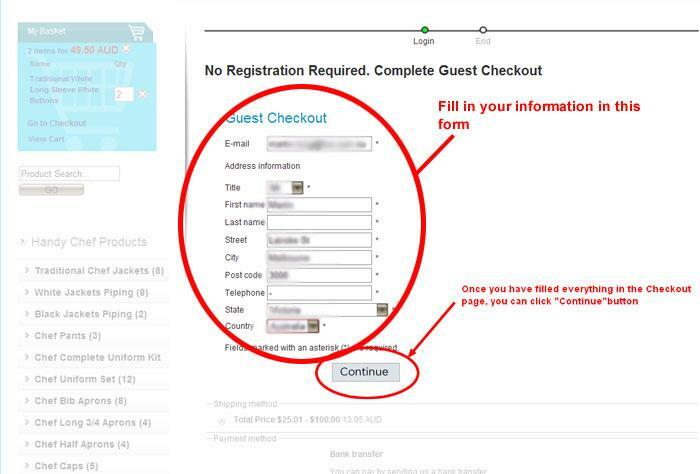 Scroll down the page a little bit again, and click "Next" button to finalise the checkout process. USING BANK DEPOSIT METHOD: In the next screen, after your order has been completed, you will be presented with a confirmation screen detailing your order. You can print this page for your receipt, and a confirmation email will also be sent to your supplied email address. 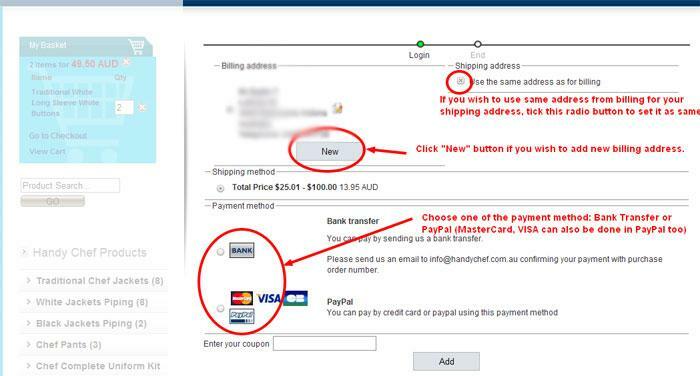 USING PAYPAL OR CREDIT CARD METHOD: In the next screen, after your order has been completed, you will be presented with a PayPal Login screen in which you must login with PayPal account or fill in the section to pay with credit card through PayPal. 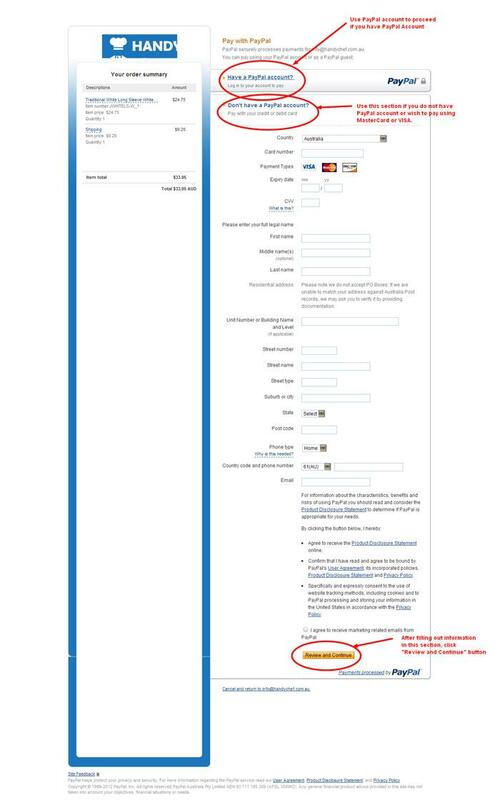 After successfully paying via PayPal, you will be shown the confirmation screen where you can print this page for your receipt, and a confirmation email will also be sent to your supplied email address. Would you prefer to place your order over the phone or via email? 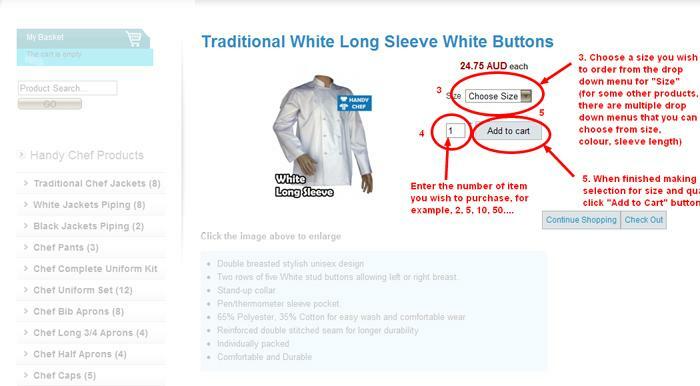 You can contact us via email or call (03) 9717 0359 / 0432296054 to process the order manually. My order has not arrived. What happened? You will be notified when you order has been dispatched. If you have not received a notification within two business days please contact us to ensure we have received your order. If you have received notification please wait for delivery of up to one week. As soon as we receive your order you will be sent an automatic email confirming the order and your order number. Anytime you have further questions you can email us and quote your order number for a prompt response. If we have any queries we will contact you via the details you have forwarded. What are the delivery charges and the postal service? Postage rates for purchases from only handychef.com.au. Prices are for Australia wide shipping with tracking number. Once we despatch your order we will send you an email advising the tracking number. All orders over $100 Free postage via Express post . 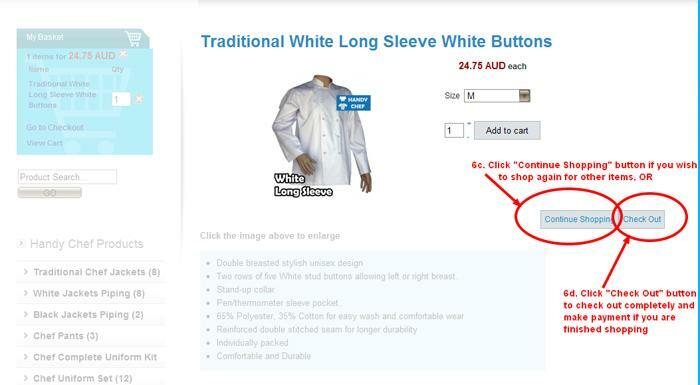 We prepare your order for delivery right away using Australian post . These timetables are approximate guidelines only and based on reasonable expectations and experience with Australia Post. How can I place an order internationally? All international orders are processed manually. We only accept payment via Pay pal. Please contact us via email or call +61 (03) 9717 0359 for shipping quotes. You will be notified when you order has been dispatched including your order tracking details. If you have not received a notification within two business days please contact us to ensure we have received your order. If you have received notification please wait for delivery of up to one week. Can you deliver my order via Express Post and how much you charge extra? Please choose express postage option if you want to get delivered by express post. Why don't you have this item in stock (I have already paid for it)? If a desired item is not in stock, we will place the item on back order for you and advise of an estimated time of delivery. You will not be charged extra postage for additional deliveries. You will always have the following options for items not in stock. Advise us to deliver the balance of your order immediately and send backordered items when available..
Or canceling the unavailable items and get the balance of your order. Or canceling your entire order. How will I know when my backorder has been sent? You will receive an email notification when your backorder has been dispatched. What is your return/exchange policy? What are the fees? you’re welcome to return it within the specified time frame of 7 days. 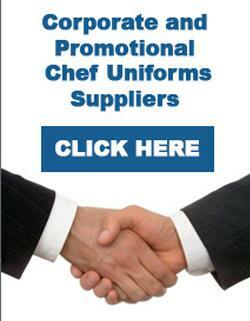 At Handychef we do not charge re-stocking fees from our customers for exchanges or refunds. To be eligible for a refund or exchange, buyer must notify us within 7days of delivery and must seek prior approval. All return postage cost covered by the customer. A prepaid satchel must be included with your exchanges for return postage to you. Items must be returned in new condition. Products that have been used, worn, damaged or not in a re-saleable condition are non-returnable. Change of Mind or Request refund - If changing mind Reslu Apparel will only refund product costs. Refund amount does not include any postage costs or handling charges incurred by Reslu Apparels. Refund amount is always subject to inspection of return goods and must comply with our return policy. What happen if I receive faulty or incorrect item? We are happy to exchange or refund your money. No extra postage to be paid. I have a question that wasn't answered. 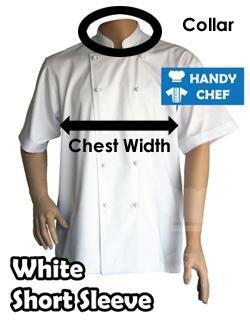 How can I contact the customer service of Handy Chef?